Ligustrum is a genus of about 50 species of deciduous, semi-evergreen, or evergreen shrubs and trees found in woodland and thickets in Europe, north Africa, the Himalayas, Asia and Australia. They bear opposite, variably shaped, often glossy leaves. In summer they carry panicles of small, scented white flowers followed by small round fruit. Ligustrums make excellent bonsai. Ligustrum make good material for beginners as they are very forgiving and virtually indestructible. 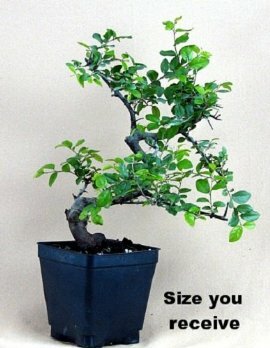 BONSAI CULTIVATION NOTES POSITION Ligustrum make excellent indoor bonsai and will also tolerate indoor growing conditions as long as humidity levels remain reasonably high with the use of humidity trays. They prefer full sun to very bright, indirect light. Keep evenly moist, not wet or dry. FEEDING Feed monthly, spring through fall. REPOTTING Annually in Spring as new buds extend; use a basic soil mix. PRUNING Trim to shape through the growing season, remove overlarge leaves and shoots with overlong internodes. Hard prune during the late Winter or early Spring before new growth starts. Wiring can be carried out anytime, though Spring-Summer is best. . You will receive a potted, imported Japanese Ligustrum growing in a 4" pot and well rooted. They are about 8" tall with a stylized trunk. Similar to the one pictured above. The trunk diameter is 1" inch.